Dies R Us: Spring is Bursting Out Everywhere! I began by cutting my finished image with Spellbinders Adorning Squares. I then cut 4 Magnolia Cute Corners and glued them onto the corners of my card first. If you get into the habit of always gluing down your corners first, it is much easier to center your main image in the middle of your card. I just got this Spellbinders Blooms One die yesterday and am already in love with it. The die gives you 3 different flower sizes which can be stacked for amazing flowers! I decided to go with the 2 smaller of the 3 to keep the proportions of the card, and finished them off with a button which I colored to match the flower on my image. I hope you have already checked out Mikha & Darlene's posts from earlier in the week. And don't forget to come back tomorrow & Friday to see what Robin & Alicia have for you. 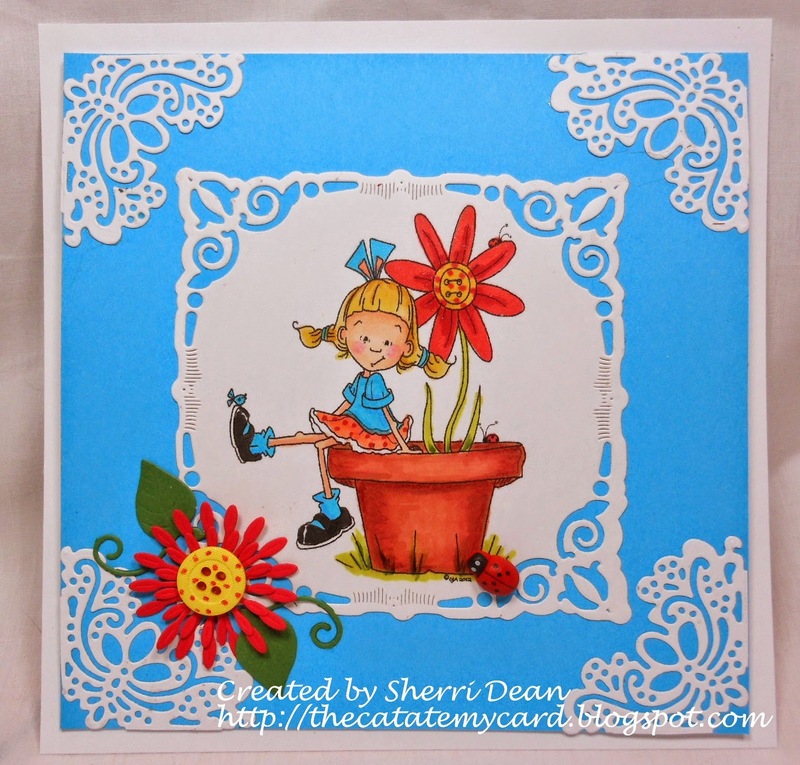 Hopefully, you will get an idea from one of our cards that you can use on our Dies R Us Challenge Blog! If you haven't entered one of them yet, be sure you do! It's lots of fun & you have the chance to win prizes! I'm heading back to the Dies R Us store to check out all the new arrivals! See you there! What a cute image and you've colored her perfectly Sherri! GREAT use of dies to really bring her front & center! Awesome job once again! What a cutie your image is. I am ALWAYS so impressed with your coloring. It is definitley not my area of expertise! I LOVE the bright cheery colors of this card. I have long wanted those Adorning Squares... on my wish list! I love how your diecut flower mirrors the image flower...I also really love those corners... This is a GREAT card...LOVE LOVE LOVE! Your image is too cute and as always colored beautifully! Love the corner dies and your flower.